Rob and Susan (Hinrichs) Anderson brought a sample of Ed & Art Hinrichs’ “Week’s Roundup” editorial cartoons to our February 2010 history club meeting. 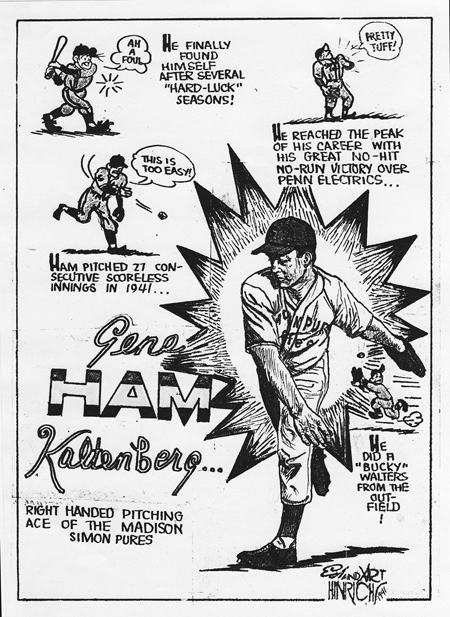 I knew the style looked familiar–a Hinrichs cartoon appeared in An East Side Album, featuring Gene “Ham” Kaltenberg, submitted by Joan Steffen. Rob and Susan have a collection of the Hinrichs brothers’ cartoons and we hope they share more with us. The twin brothers worked together at the Capital Times for decades. According to their obituaries, Art Hinrichs joined the sports staff of The Capital Times in January 1951. In 1958, Art started writing a weekly sports column, “Pinch Hitting.” In February 1959, he started drawing “The Week’s Roundup.” The idea originated with publisher William T. Evjue, who brought the idea to Art and asked him to do it. The family recalls Art saying that he was happy in the sports department and couldn’t handle both jobs, so he told Mr. Evjue that he had a brother who drew, too. Thus, Ed was hired in 1959 to “help” Art with the Roundup, but it turned out that Ed did most of it himself. “The Week’s Roundup” became a Madison tradition for the next 12 years. 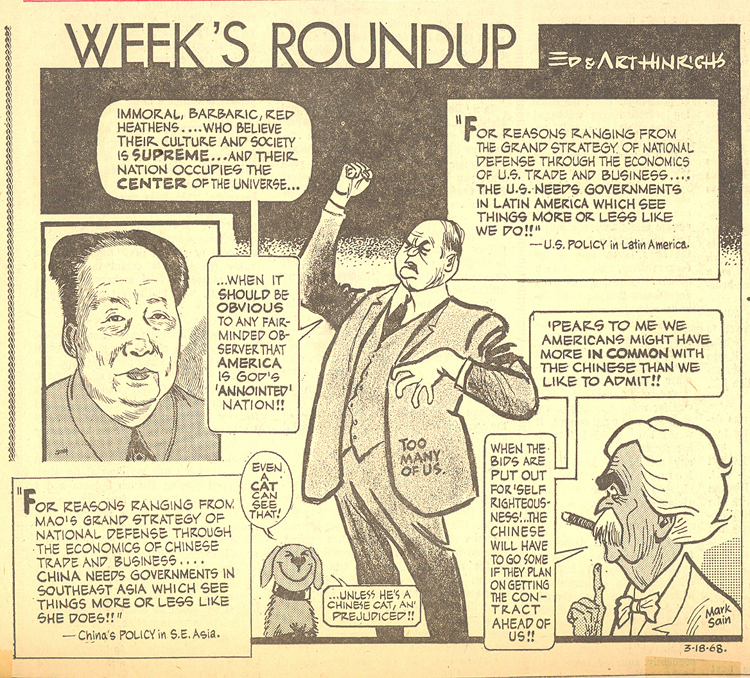 In addition, Art contributed more light-hearted cartoons once or twice a week. Besides the weekly Roundup on the front page of the Monday editorial section, Ed and Art contributed occasional cartoons or caricatures for the sports page or front section of the paper. Newspaper staffers confused by the identical twins came up with the saying “Ed is the artist, Art is the editor,” to help remember which was which. As a member of the sports staff, Art covered local high school football, basketball, baseball, bowling, industrial and Home Talent League baseball. He became The Capital Times sports editor in June 1973. Meanwhile Ed was the editorial cartoonist/staff artist of The Capital Times for more than 30 years. The twin brothers retired in 1990 at age 67. World War II veterans, Art and Ed served in Italy together. Both brothers were talented amateur baseball and softball players in the industrial and city leagues. In 1949, Art even had a tryout with the Philadelphia Phillies. Ed managed the Bowman Dairy team in the Industrial League; he later played in the Home Talent League and then played softball until age 50 with Madison Newspapers. Ed Hinrichs, died March 28, 2001, at the age of 77. Art Hinrichs died on Sept. 30, 2004, at the age of 81. Susan Anderson says, “We are so delighted that Ed and Art’s career work can be shared with others. They not only were gifted artists and ball players, but were extraordinarily kind and giving gentleman to their friends and family.” Like so many Madisonians. Eugene “Ham” Kaltenberg played for the Simon Pures Industrial League softball team. Lowell School may have been Madison’s first school to participate in the federal hot lunch program, but the teaching sisters of St. Bernards’ School had them beat with hot lunches that featured “home cooking” favorites like Sloppy Joe sandwiches. Jackie Senteney Currie Straavaldsen brought memories AND a recipe for St. Bernard’s Sloppy Joes to the February 20th meeting of the East Side History Club. You may cook this recipe on top of stove or bake it in the oven. If you choose the oven, preheat to 350 degrees. Jackie prefers the stovetop method. Brown the meat and onions. Add remaining ingredients. If cooked on top of the stove, add 1/2 to 1 cup of water and simmer 30 minutes. Or omit water, cover pan tightly, and bake in 350 degree oven for 1 hour. 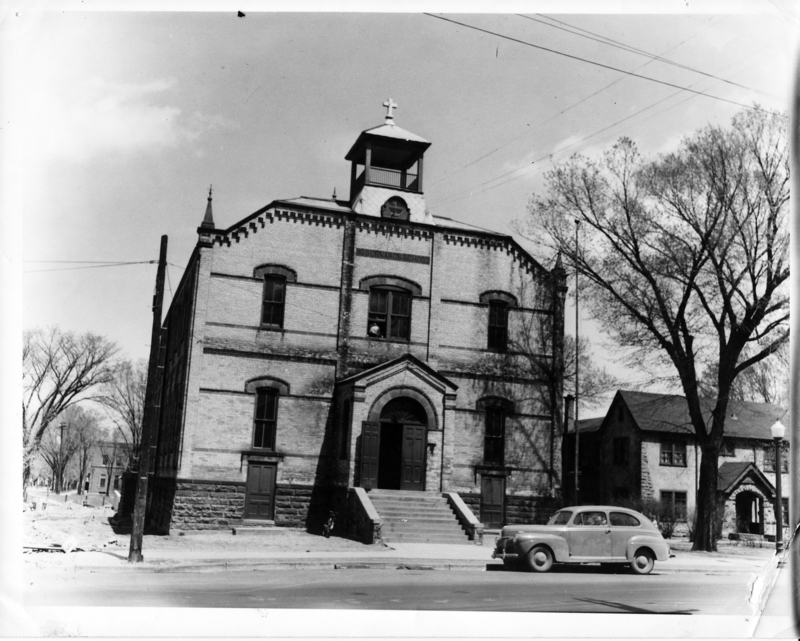 St. Bernard’s school and convent, 1950. Photo courtesy of Thomas Moore. We’ll reminisce about “Meals and Memories” on the East Side, using artifacts and images to bring back memories of our neighborhood’s flavors. Come prepared to share YOUR memories! Here’s an idea: Make and bring a recipe from An East Side Album to share! We’ll meet Saturday February 20th 2–4pm, at the Goodman Community Center, 149 Waubesa St. $2 suggested donation. 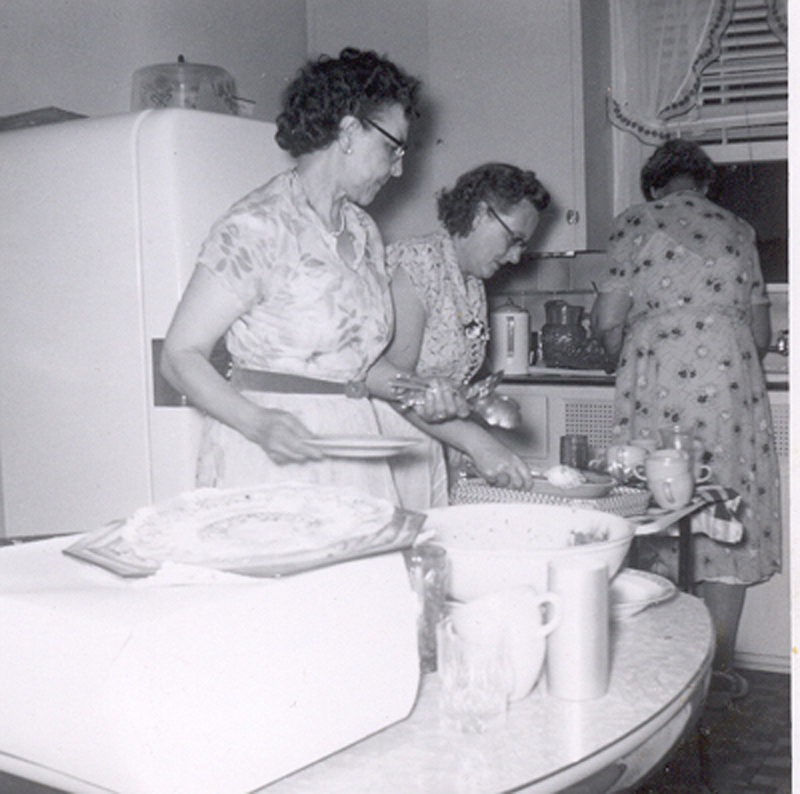 “Church ladies” Marie Trydal and Doris Strand Frydenlund prepare food for a Bethany Evangelical Free Church event. Photo taken at the home of Doris Strand, 206 Lake Edge Blvd, circa 1970, courtesy of Don Ross. 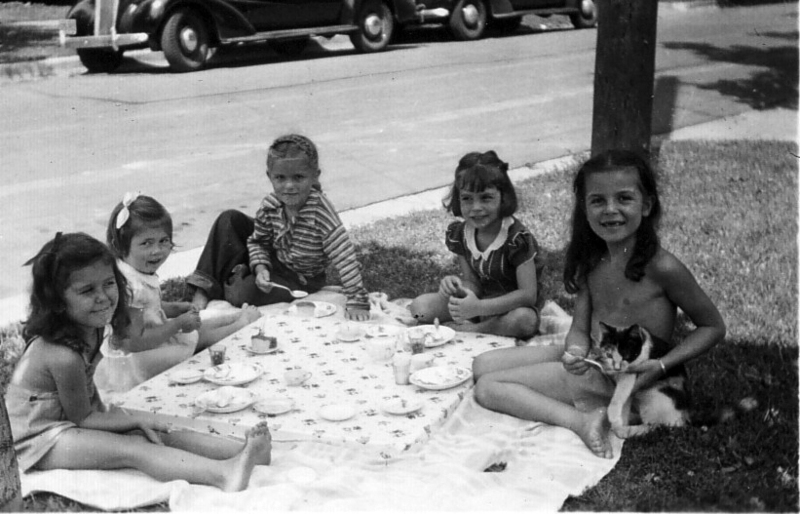 A tea party on Talmadge Street in late 40s. From left: Catherine Tripalin, Patty Gorst, Phyllis (Sullivan) Brown, Mary Jean Hasslinger, and Elaine Tripalin. Photo courtesy of Catherine Tripalin Murray. Wondering if your home is a part of a Madison historic district or listed in the National Register of Historic Places and what it all means? This program will explain the processes for local, state, and national designation, the meaning of designation, and dispel the common myths that discourage owners from listing their homes. Trust Executive Director Jason Tish will discuss local designation and Wisconsin’s National Register Coordinator Daina Penkiunas will explain how to be individually listed or part of a National Register Historic District.